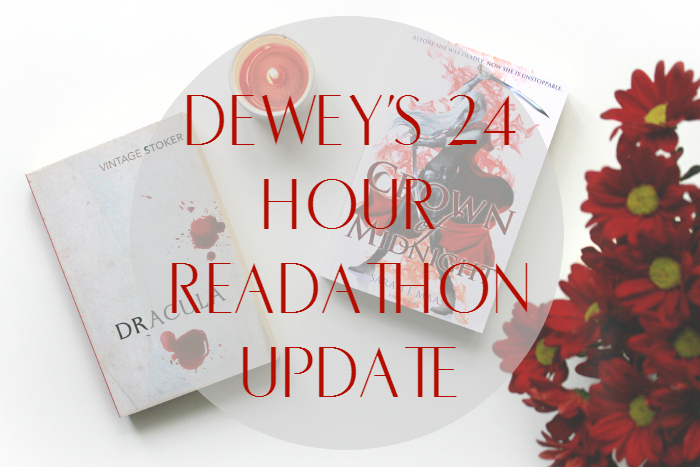 Today's blogtober post is just a little update on my progress with Dewey's 24 hour readathon! Apologies if this post is a load of rambling nonsense, I've been reading for almost 9 hours straight *goes cross-eyed*. We've just finished hour nine and I'm still on my first read, Crown of Midnight by Sarah J. Maas. I've read 277 pages so far and I'm super proud of myself! I started off strong at the 1pm start time here in the UK and read roughly 50 pages an hour for the first few, taking frequent breaks for Twitter distractions and snacks! My reading slowed down a little mid-afternoon as I took the dogs for a walk and kept getting distracted by Twitter and such but I got back into it this evening and have been going strong ever since. I'm making sure to take regular short breaks and I think that's really helping. My plan for tonight is to get some more reading done whilst having a lovely Lush bath (the comforter bubble bar is my life-saver right now). Then depending on how far I am in Crown of Midnight I might either finish that up or switch over to my most recent purchase Horrorstör by Grady Henrix, for some spooky late-night reading before bed. I'm not sure how late I'm going to stay up, I'm not going to torture myself and if I feel like sleeping then I definitely will. I'm not someone who does well without sleep and I tend to need excessive amounts just to function. So I'm just gonna see how it goes. Tomorrow's plan (if I wake up early enough) is to finish up Crown of Midnight and move on to Dracula by Bram Stoker. I've got a non-readathon-related post scheduled for tomorrow but I'll be doing a full readathon wrap up on Monday, so keep an eye out for that. I've been tweeting all day over at @sarahs_chapter and I've really been enjoying interacting with other readers, I personally think that's one of the best parts about readathons, the community is so wonderful and supportive! Make sure to follow me on Twitter to keep updated with my readathon thoughts and let me know if you're joining in too!